Even among the most intriguing stories of fascinating characters who have held world boxing titles, the one about Alexis Arguello is a classic. Arguello was a real-life warrior, a fighter in the ring, a popular leader, a politician, mayor of a city in Nicaragua, a film and TV star, and a drug addict. In the end he shot himself, according to police reports. Others say he died mysteriously, eight months after winning the mayoral election. The story of Arguello’s life and boxing career makes excellent reading in the book Beloved Warrior – The Rise and Fall of Alexis Arguello by Christian Giudice. Known in later years as El Flaco Explosivo (The Explosive Thin Man), Andres Alexis Arguello Bohorquez was born in Managua on April 19 1952. He was one of eight children whose father was a shoemaker. The mother sometimes told Alexis to take his slingshot and go hunt for food. When he was successful, he brought back lizards and iguanas. Pambele was the director of the National Boxing School in Nicaragua. He travelled from gym to gym in Colombia and fought for small purses in what was estimated to be more than 250 fights. Such was his status that the legendary Colombian world champion Antonio Cervantes adopted the nickname Kid Pambele. When Pambele and Carlos “Kid Varelita” Varela Sr, a former boxer, saw the skinny 14-year-old Arguello in his first sparring session, they were amazed. Wearing 16-ounce gloves. the tall and lanky youngster knocked out two sparring partners. Arguello, encouraged by his father to box for money, was a skinny 53.52kg bantamweight and 16 years old when he turned pro. Most record keepers say his first fight was against Daniel Cordua, whom he knocked out in the second round on August 24 1968. Arguello recalled the bout: “This guy offered me $100 to go and fight in Leon. I went to win the $100 for my mom. I got knocked out in the first round. I just threw a right hand and the guy made me miss. I went down and he hit me right in my liver. And I didn’t get up. I just sat there. Arguello won 30 of his next 32 fights before Jorge Reyes stopped him in the sixth round on January 15 1972. He was cut and had an injured hand. After remaining undefeated in his next 13 fights Arguello challenged Ernesto Marcel for the WBA featherweight title. They met in Panama City on February 16 1974 and Arguello lost on points. On November 23 that year, at the Inglewood Forum in California, he went in against the legendary Mexican Ruben Olivares, whose record was 78-4-1 at the time. Olivares, who had succeeded Marcel as champion, took an early lead before Arguello knocked the champion down twice in the thirteenth round. He won on a knockout. After four successful defences he moved up to super-featherweight and in January 1978 won the WBC title when he stopped Alfredo Escalera in the thirteenth round. After eight defences he challenged WBC lightweight champion Jim Watt of Scotland at the Empire Pool in London. 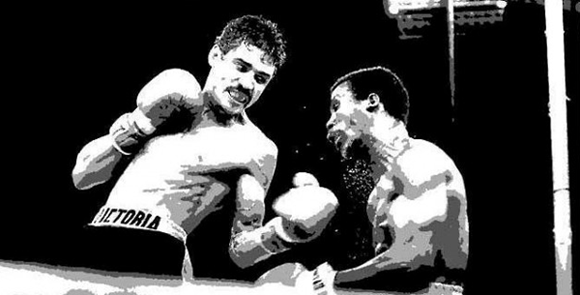 In a boring encounter Alexis outpointed Watt over 15 rounds to claim his third “world” title, which he defended against Ray Mancini, Roberto Elizondo, James Busceme and Andy Ganigan; beating them all inside the distance. Arguello had almost run out of opposition in the lightweight division when the calls started for him to fight Aaron Pryor, the unbeaten WBA junior welterweight champion who had become a popular fighter on television. Hoping to win another title in a fourth division, Arguello went into the bout as the 2-1 favourite. They met at the Orange Bowl in Miami, Florida, on November 12 1982. The referee was South African Stan Christodoulou. According to the book, confusion reigned when the master of ceremonies, Hector Salazar, was unable to silence the 23 800 fans. Dozens of Pryor’s supporters and camp members jumped into the ring. There had been rumours of a gun-toting man, supposedly working for a political group, who tried to break into Arguello’s dressing room. The man was arrested. Arguello put up a gallant effort but Christodoulou had to stop the fight in the 14th round. Afterwards there was some controversy over a “special” water bottle that Pryor’s trainer, Panama Lewis, introduced after the 13th round, but the Florida State Boxing Commission never conducted drug testing. After the fight Arguello fell into a depression. He once locked himself in his bedroom in his Kings Bay home, watched a recording of the bout and refused to see visitors. His handlers pushed for a return match against Pryor and after Arguello had beaten Vilomar Hernandez and Claude Noel, the two met again – at Caesars Palace in Las Vegas on September 9 1983. This time Pryor was an 11-5 favourite and he knocked out Arguello in the tenth round. Arguello retired after the fight and five weeks later sneaked into Nicaragua by going through Costa Rica. He set off into the mountains to join Eden Pastora, “Commander Zero”, and his 4 000 troops who were preparing to fight the communist regime. In 1984, the Sandinistas held their first election since they toppled the Somoza regime in 1979. By March 1994 Alexis was back in Miami; training for a comeback to solve his financial problems. Reports of Arguello using drugs started circulating at the time but in 1985 he beat Pat Jefferson and Billy Costello before retiring again in February 1986. Two months after his last fight he was diagnosed with a coronary disease. His good looks earned him a few small parts in three movies and in several episodes of the TV series Miami Vice. Clearly an intelligent man, Arguello also worked for a Spanish-language TV network and as a goodwill ambassador for Donald Trump and signed up for English grammar classes. He intended to return to Nicaragua from where he was exiled for more than ten years, hoping to collect an estimated $1 million owed to him by the previous government. On May 8 1990 he finally returned to hero’s welcome at the airport. For a short time he worked as director of boxing, the sport that the Sandinistas banned in 1981. Arguello opened his gym that the Sandinistas had seized and retained one of his homes that had been confiscated in 1979. But he ran into financial problems again and, despite the diagnosed heart problems, returned to the ring at the age of 42. On August 27 1994 he fought Mexican Jorge Palomares and, weighing 63.60 kg, won by majority decision over ten rounds. The next year, in Las Vegas on January 21, Arguello had his last fight; losing on points to the 25-year-old Scott Walker. He finished with a record of 89-9, including 70 wins inside the distance, if one includes the fight against Cachorro Amaya. Towards the end of 1999 Arguello was down and out; emaciated and hooked on cocaine. With the help of friends, he went into a rehab facility, recovered and was appointed sports and youth minister in 2002. He became deputy mayor of Managua in 2004 and held the position for three years. Then he fell into drug abuse again and disappeared in January 2005. This time he recovered on his own and he was elected mayor of Managua in November 2008. On July 1 the next year the Nicaraguan police said the 57-year-old Arguello had committed suicide; that he died from a single gunshot to the chest. But many people suspected foul play was involved. Arguello, who married five women and had several children, was elected to the International Boxing Hall of Fame in Canastota in 1992. Beloved Warrior – The Rise and Fall of Alexis Arguello is an excellent hardcover book of 247 pages and is published by Potomac Books.